Max is about to face the scariest place he’s ever been – South Ridge Middle School! He has been home-schooled by his grandmother until now, and he’s begged his parents to finally let him start attending a real school. He’s starting to question that choice, though, with the Doug aka Thug Thurston Problem. As in, Thug keeps stuffing Max in his locker. If only Max could be like the hero in all the comics he likes to read – or the ones he draws – and magically escape the locker and defeat Thug. Unfortunately, Max’s uncanny, almost superhuman ability to smell pizza from a block away won’t exactly save any lives or foil bad guys. But that doesn’t mean Max won’t do his best to be the hero his school needs! That's not just because it's about a boy, as I've read some other books recently which I adores. Maybe it was because it kept a similar style/format with illustrations as Dork Diaries. I missed all of Nicki's exclamation marks. Max had some, but not as many. He didn't have a sidekick friend either – Erin doesn't feature for a lot of the story (the character rather than Rachel's daughter). However, there is a lot of serious danger, as well as the usual humour which comes with Rachel's work. It's that danger which had me hooked, and the cliffhanger ending is absolutely EVIL!!!!! It means I definitely will be reading book 2, that's for sure! On to what I love about the book. I love the illustrations which have a unique style which I love thanks to Dork Diaries. I do love the reality feel of Max's adventure, which gets scary rather fast. 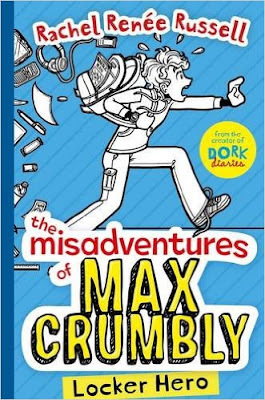 I love how Brandon from Dork Diaries is worked into Max's life – having a slight crossover for the wellknown series adds a sense of familiarity, even though it's a totally different school. Technology is used well as plot points, there's some ridiculous scenarios for humour, and some heart in mouth moments which I think are greater than similar plot points in Dork Diaries. Please be careful if you eat or drink while reading this book, there's one part where you may be put off your food. I thankfully wasn't eating at the time of the part where poor Max suffers. Overall it's a great read, and I can see potential for all readers to enjoy it for different reasons. 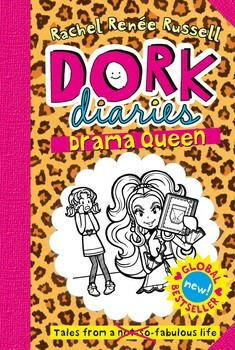 Find out more on Rachel's dedicated Dork Diaries website.